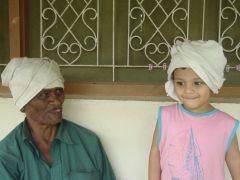 Mr. Palaniappan is a spirited 70 year old elderly person that takes care of the farm on which our current home is built. He lives away from his family but that doesn’t stop him from cooking great meals for himself. On a laid back afternoon, Aum and I were sitting on the porch and chatting with him. And he suddenly exclaimed “My wife!”. I looked and saw a very very old woman, old enough to be his mother. For the first time, I looked deeply into his eyes and his left eye was heavily clouded. No wonder the landlord was unhappy with him for missing out on obvious work items in the farm. When I broke two pieces of bad news in a row, he went into a few minutes of hesitant silence. But he quickly agreed to go for a check-up and get operated if necessary. Aravind Hospitals was a natural choice. They would treat him with dignity, perform the cataract surgery for free and the overnight stay would cost us a very reasonable Rs 500. He enjoyed all the usual annoyances associated with a trip into the city – running to cross busy roads, crowded restaurants, loaded buses and even the pollution! At Aravind, the doctor confirmed a very mature cataract and he was asked to stay back for the surgery the very next morning. The day that dawned happened to be our wedding anniversary and the surgery helped us start it with Gratitude. Dr V and every one at Aravind have made the gift of eye sight look so easy and natural..even for a layman like Mr.Palaniappan.